2 tbsp homemade gingerbread syrup (see tip, below). Fill a cocktail shaker with ice. 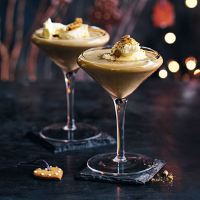 Add 25ml Smirnoff Vodka, 25ml Kahlúa, 25ml Baileys Irish Cream and 2 tbsp homemade gingerbread syrup (see tip, below). Shake well and strain into a Martini glass. Softly whip 50ml whipping cream and spoon it on top. Garnish with a crushed gingerbread biscuit or a small brandy snap. Gently simmer 120ml water, 100g brown sugar, 4 tbsp black treacle and 1⁄2 tsp each ground ginger and ground cinnamon in a pan for 15 minutes. Cool and store in an airtight bottle. This recipe was first published in Fri Nov 06 14:52:00 GMT 2015.